Waiting for the next in a series? Here they are! New Sequels in Popular Series! The sixth and final instalment in Chris Colfer's hugely popular middle grade Land of Stories series. Mayhem beckons, with fairytale heroes, villains and monsters who have escaped their world descending on our world--can Conner and Alex prevent disaster? Find out more about author Chris Colfer in this interview! The perfect combination of whodunit, fun and adventure for middle grades. In the latest adventure in the FunJungle series, the zoo's new panda disappears en route to the zoo. Young sleuth Teddy Fitzroy is happy to leave the case to the FBI, until someone threatens his girlfriend and he's dragged into the mystery. If your teenager loved the I am Number 4 series, we have good news! Generation One is a fast-paced YA sci-fi adventure set in the same world, a year after the Garde released Loric energy to save the world. As a result, some human teenagers are developing incredible and potentially lethal powers. Can they learn to control them before they are needed? In this exciting fantasy for middle grades, a companion to the Fablehaven series, the dragons seek to return to the Age of Dragons, when they ruled the world. The only hope for the world is the ancient order of Dragonwatch, but its original members are long gone. Kendra and Seth must work together to tap into their dragon taming powers and battle to save the world. Middle graders with a taste for horror and action will love this series. In this second instalment, Serafina is torn between two worlds: the wild world of the catamounts in the woods and the sophistication of Biltmore estate. And then mysterious attacks begin and Serafina must confront an evil that threatens both worlds. The fifth hilarious installment in this graphic novel series about young Jedi knights in middle school. Nothing seems to be going right for Victor Starspeeder. Can he stay focused (use the force!) or will he take refuge in being the class clown? All on our shelves at the time of writing, but selling fast! Come into the store for your copy, call to reserve one or buy now on our website! Our new YA and middle grade LGBTQ fiction section is proving popular and it's constantly growing. We believe younger readers should also have access to LGBTQ books, both to reflect themselves and the world around them. So we've gathered together our favorite LGBTQ picture and board books for younger readers. We don't have space for them all in the newsletter, but click here to see the full list on our website. And feel free to give us your own suggestions. Beautiful little board books to help the youngest readers understand families come in all shapes and sizes and they all love one another. Stunning picture book about creativity and acceptance. Morris is very imaginative and his favorite activity is to dress up in his classroom's tangerine dress. But the other kids won't let him play in their spaceship, because they say dresses aren't for boys, or astronauts. But when Morris creates his own amazing space ship, his classmates start to see him differently. A classic and true story about two boy penguins from the Central Park Zoo who fall in love and want nothing more than their own egg and baby penguin. And then Tango comes along. A lively story that confronts the resentment kids can feel when a beloved family member has someone new to love. Mia adores her Uncle Tommy, who adores her right back. But when Tommy's boyfriend, Fergus, appears on the scene, Mia is not happy. Mia is perky, defiant and utterly realistic! A new edition of the beautiful story that helped progress acceptance of different family structures. Heather has two mommies, but when she starts school someone asks her about her daddy. She and her classmates learn all families are different and what matters is love. A quirky story about self-discovery. Red crayon isn't quite what the other crayons expect and however much they encourage him to change, he just can't. But then he, and the others, learn what's great about him and celebrate him just as he is. 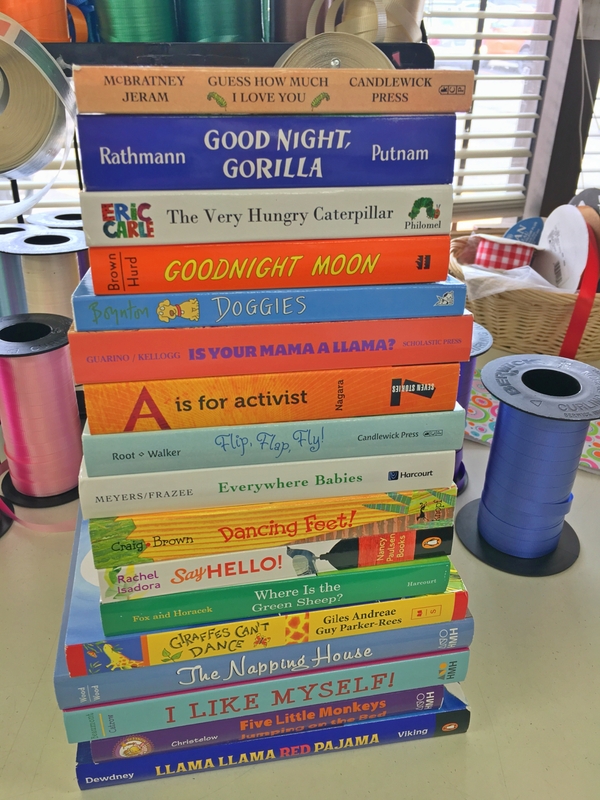 How do you create the ultimate list of books for a new baby? First of all we picked out the stack of books on the left for a customer's baby shower. Then, we asked our readers on our Facebook page what they'd add--and with over 50 comments, we've created THE list for the newest reader in your life! Click here to browse through our extensive list--from the classics to modern-day activism! Looking for something different? Here are some of the newest books in our toddler department. A brand-new must have to add to our list! This is a tongue-in-cheek guidebook to a baby's life, told with Willems usual wit and charm and bold colorful graphics This one-of-a-kind book is destined to become a classic. Momo the border collie is famous from Knapp's photography, hiding in the background of his photos. Now this colorful board book version, brings the fun of finding Momo to younger readers! A wonderful early read-aloud for younger children, with bright illustrations, minimal words and a feel-good story that is particularly good for toddlers with a younger sibling on the way or already in the cradle! Raybot always wanted a younger brother, but Weebot is more annoying than fun. What can Raybot do? All the board books in this series, which includes Baby's Feelings and Baby's Day, feature big, beautiful colorful photos of babies to share with your own baby. All in stock at the time of writing, but don't forget we are always happy to order books for you. Don't miss these two amazing memoirs! Two remarkable new memoirs are on our shelves now. Sherman Alexie's You Don't Have to Say You Love Me is a complex and unflinching story of Alexie's relationship with his contradictory and mercurial mother. Alexie doesn't hold back, making this a difficult read at times, but his memories spill out onto the page with raw, poetic power. A great discussion book. In Hunger, Roxane Gay confronts her own weight, her past and the decisions that have brought her to where she is now. A fascinating and almost unbearably candid must-read for anyone interested in the link between weight, self-worth and visibility. And, again, a book that begs discussion. This will be a magical afternoon that your child will never forget! Sail over to The Bookies Bookstore on September 9th between 3-4 p.m. to meet Magnificent Moana! She'll share her love of the sea, and her sense of adventure. She's spunky, fun and all about friendship. This is a free event and photos are encouraged! Book Clubs: A Conversation with Larry! One of the suggestions we hear most often from you is for Larry to lead an event devoted to title suggestions for book clubs. We're delighted to announce that on the evening of Monday, September 18th, from 7-8:30 p.m., Larry will host an evening gathering, exclusively for book club members. The event will kick off with Larry presenting the latest books he believes will stimulate great discussion, covering a variety of genres of fiction and nonfiction. After the presentation, he will lead a group discussion around our shelves, where you can browse, pick out titles that interest you and ask questions. And, you'll receive a 20% discount when you place an order for three or more books for your club within a week of the event (using any method of payment). You'll also have the chance to meet like-minded book clubbers, learn about outstanding new reads, enjoy light refreshments and get exclusive after-hours access to our shelves and staff. Tickets are $5, and you can buy yours at the store, by phone (303) 759-1117, or by emailing us at info@thebookies.com. On the night, you will receive a $5 voucher towards a purchase. Numbers are limited, so everyone has time to explore their particular interest-RSVP early! Bookies Bestsellers: This Summer's Most Popular Books! What have you been reading this summer? We've just updated the front page of our website to show the titles that we've sold most of this summer for adults and young adults. Take a look! Our From Puppy to Partner event was one of the most wonderful afternoons we've had in the store. To have six fantastic assistance dogs, from young to experienced, hang out with us was a privilege. Rumba, who is a fully trained assistance dog, impressed us with her skills--for example, picking up a dropped mobile phone with her mouth, so gently that she didn't mark the phone or inadvertently call anyone (is tooth dialing a thing?). The other dogs were younger puppies, waiting to start their own training, but all were beautifully behaved, and every dog was delighted to be petted. Thank you to our own Marianne, Rumba's partner, Michelle, and all the other volunteers who brought in their dogs and shared so much about puppy raising and the work of assistance dogs. If you want to see Rumba at work, take a look at this little video, showing her helping Michelle. And finally...a fond farewell to our own Dubarry, who Marianne has been raising since he was just a few weeks old. Young assistance dogs need to be socialized, so he's been coming into the store with Marianne for over a year. He has a special cushion under her desk, where he sleeps away most of the day. But he's always ready to greet people (after he's been given his command to 'release') and play a quick game with a toy. We'll miss him so much, but that's only a fraction of how much Marianne will miss him. Good luck at Dog University, handsome boy!